Start out with some small bites for the table. 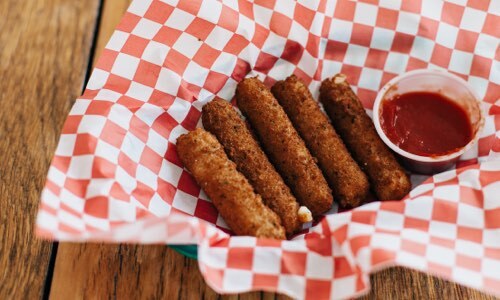 Locals love our fried pickles and mushrooms, and garlic bread with cheese is a kids’ favorite. Shorty's pizza dough tied in a knot, deep fried, and tossed in our Italian spices blend. Served with Shorty’s homemade marinara. Dredged in buttermilk and house-made batter, fried to order. Served with ranch dressing. 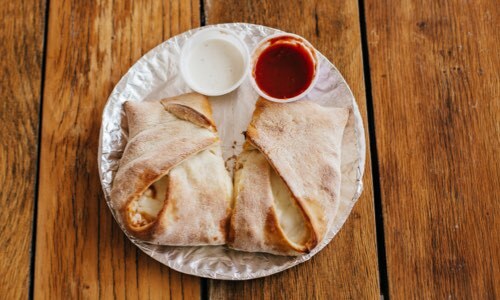 Shorty’s house-made pizza dough, stuffed with cheese and toppings, folded like a pillow, and baked. Served with Shorty’s homemade marinara or ranch. Iceberg & Romaine lettuce with shredded carrots, cabbage, tomatoes, onions, mushrooms, cheese, hard-boiled egg, and home-made croutons. Served with your choice of dressing. Add chicken to any salad for $1.99. Feeling Spicy? 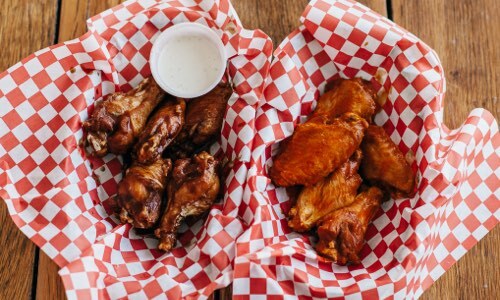 Have your chicken tossed in mild, hot, or Vitek’s BBQ wingsauce. We value fresh, high-quality ingredients. 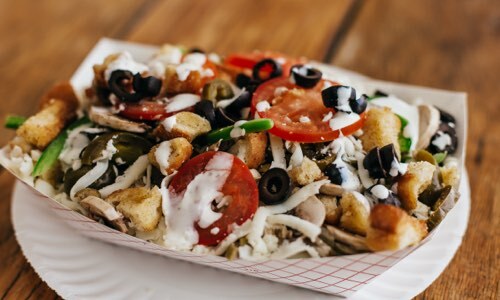 That’s why we only use fresh-made pizza dough and marinara sauce made in-house, grate our own mozzarella, and hand-chop fresh vegetables every day. 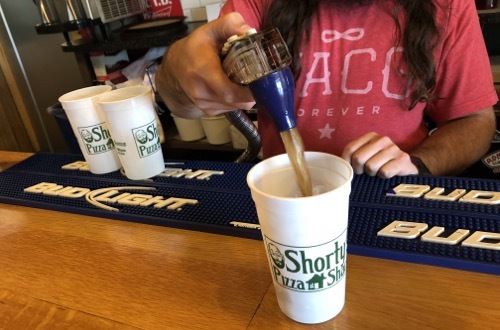 Plus, Shorty’s Italian sausage and hamburger toppings are made from our own recipe, using spices and fresh-ground beef and pork with no fillers, additives, artificial flavors, or preservatives. Topped from crust to crust with Pepperoni. If you're feeling a little spicy make it a Bones-eroni. We add Shorty's hot wing sauce to the marinara for a little kick. It's awesome! Italian Sausage, Pepperoni, Canadian Bacon, Hamburger Beef, Onions, Spinach, Tomatoes, Pineapple. Green Olives, Black Olives, Mushrooms, Jalapeños, Fresh Basil, Bell Peppers. 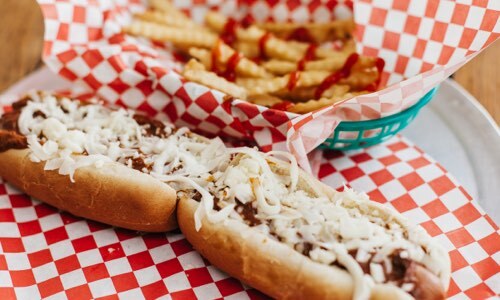 TWO chili cheese dogs served end-to-end for a foot of chili-cheese greatness. This is a knife and fork operation, folks. Add jalapeños and onions for $1.49. 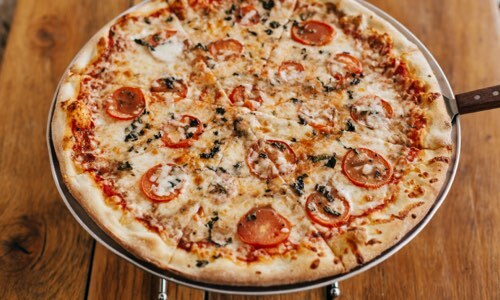 Shorty's house-made pizza dough tied in a knot, deep fried & drizzled with a sugar glaze. 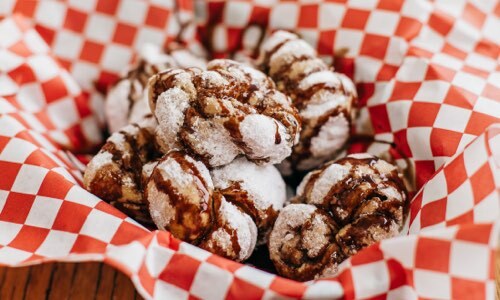 Shorty's house-made pizza dough tied in a knot, deep fried, tossed in powdered sugar & drizzled with chocolate sauce. A bottle of IBC Root Beer served with a scoop of vanilla bean ice cream in an ice-cold mug.